The first-time candidate won the governor’s seat back for Democrats, capping a tumultuous eight years of Republican Gov. Chris Christie leading the state. Please keep tweeting Mr President! Dems may have also won the Virginia Assembly, which no one thought possible. Several close races and recounts. The Democrats need to take this creep down in the next election! The besieged Alabama Senate candidate owes nothing to the national party. 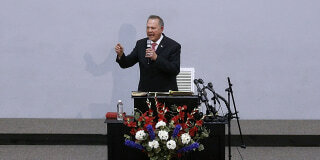 Moore issued a statement denying the accusations. Is It Time For Republicans To Panic? There is a flip side to gerrymandering. To gerrymander you build winning seats in losing areas by drawing boundaries to give these areas extra votes from winning areas. In essense strongholds are divided up to create more 'winners'. More wins, but tighter margin of victory. So if the Democrats vote increases significantly the amount of seats available grows very fast. Extremely relevant point and it has existed in Canada as well. And what it means in Canada is a lead party doing this might find a loss to a minority can become a loss to a majority. Of course the way things are done in the US it is easier to accomplish this as one level of government controls much of all elections instead of each level having their own. States control much of the fucntions of federal elections in their state. Canadians do not always realize this. When you post this -- which you do, often -- you're telling us about your current emotional state. Something is offending you!(!). Something has surprised you!(!). That's a very "Facebook" thing, to post an emotions update, and it's really not what babble is about. Would you stop, if I asked you to? If you have a reaction to something, can you say it using your words? Sometimes when posting my post gets duplicated, that's all it is. At least five companies said over the weekend that they will no longer advertise their products during Fox News' "Hannity." Fans of the show and its host criticized the brands for taking a political stance and called for a boycott on Twitter. Those that supported Keurig's decision to cut ties with Hannity praised the company and said they would be more apt to purchase goods from the brand. Has nothing to do with partisanship. Based on the fact that one juror asked the judge, "what's a senator," and excused juror called the prosecution corrupt, I think you can chalk it up to ignorance. Menendez is a crook and should be found guilty. But even as he was defended at home, the White House said the Alabama Senate candidate should step aside if the allegations against him are true. The traditional response to this is to edit the duplicate to read "(dupe)" or "DP" or somesuch, though. Editing it to "!!" gives the rest of us the impression of Wile E. Coyote suddenly realizing the cliff ended three posts behind him. Agreed but the healthy Christians are getting drowned out by the likes of Moore, Trump, Bill Clinton, etc. Will The GOP Pass Anything Before Midterms? Tax reform? Health care? Infrastructure? Place your bets!